Take a ride around Cusco and visit the impressive ruins of Sacsayhuamán. From up there, you will be granted fabulous pictures opportunities and magnificent views. Enjoy both the natural scenery that surrounds Cusco and the architectural marvels of the Incas. 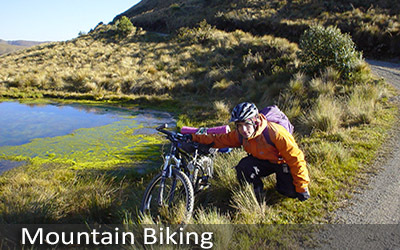 In the morning, at 9am, we will pick you up from your hotel and embark on a biking adventure around the nearby archaeological sites of Cusco. We will provide you with all the safety equipment. 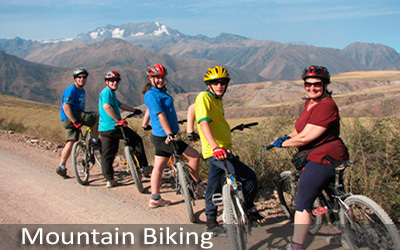 You will start your ride on a 2 mile uphill winding road up to the church of San Cristobal -previously the Inca Huayna Capac's palace- from which you can enjoy a spectacular panoramic view of Cusco. Later on, you will also have the opportunity to have a look at the beautiful temple of Sacsayhuamán, which continues to be a very important religious and ceremonial site for the Incan culture and is an example of the ingenious architectural achievements of the Incan civilization. Some of the fitted uniquely shaped stones weighed some 70 tons. Later, we will pass by the temple of the Moon with its many caves and rock carvings, where we will take a rest, relax, and enjoy the view. Along the way, with plenty of stunning views, we will stop occasionally to take photos. The neighborhood streets of Cusco will provide a beautiful backdrop as we ride until we return to our office.